Healthy eating just got a little sweeter! Go ahead, treat your self with these delicious, wholesome truffle balls! No artificial ingredients, no added sugars; just nuts, dates, dried cherries, and cocoa powder. Not only are dates a great sugar replacement, but they also provide health benefits. Walnuts are also be beneficial for men, as they may help improve prostate health. Lightly pulse the walnuts in a food processor until a fine texture. Then add the dates, cherries, and cocoa powder. Continue to pulse until the mixture starts to stick. If the mixture is a little crumbly and doesn’t stick well, add in 1 teaspoon of water and pulse until it starts to stick. With clean hands, roll the mixture into ~8 balls. 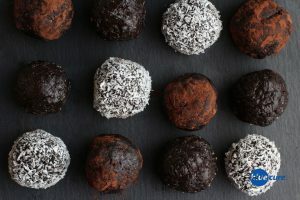 Optional to roll the truffles in more cocoa powder or coconut flakes. Place in the fridge for 1-2 hours to let them firm up, then enjoy!